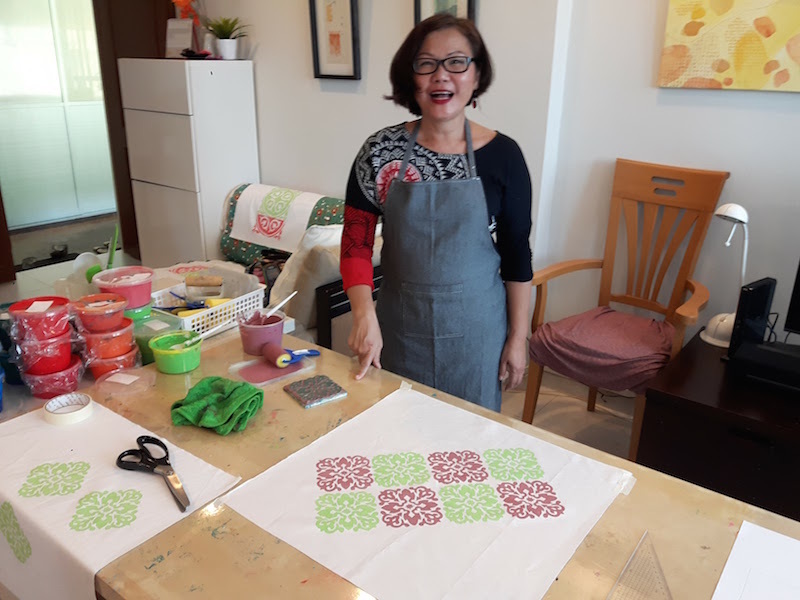 Express Fabric Printing Workshops - Why the Hurry? I love linocut printing but I've realised lately that it's not for everyone - especially those who are short on time or shy about carving. Although the new rubber types of lino make it easier for beginners, I still have people who are hesitant about using sharp tools. And I do keep my tools very sharp so that they are easy to carve with - a kind of 'catch-22'. Tracing and carving takes time and patience! But you do get to keep your block for later projects! So a few months ago, I started teaching a new 'express' class for people who simply want to have a go at printing. I got the idea from a friend who asked about my large collection of blocks that I had previously only used in demonstrations. We also chatted about busy working women, who might just want to spend a couple of hours creating something for themselves without a big time commitment. My collection has in fact built up over the past year that I've been teaching these workshops and I have over 30 designs now. Many are inspired by floor tiles that I have seen around Singapore and Malaysia. Some motifs seem very European in style - that's because many tiles in this former British colony were imported from the UK in those early days. Other tiles are a bit more modern but still have that Victorian look about them. A photo from my ongoing tile studies! I'm also now a bit of a 'greenie' since some of my printmaking teachers developed illness likely to have been caused by years of inhaling ink and chemicals. Especially after I got pregnant, I wanted to try and stick to only water-based or low toxic inks. I don't want to leave extra landfill for my kids either, which is why I like to use materials from around the house such as plastic take-away lids. I always take these home after my workshops to wash and reuse them. I love mixing up Peranakan inspired colours! I love going to art workshops myself, but often end up with things that are half finished or that I'm supposed to get framed. I honestly don't get around to completing them most of the time. That's why I also recently decided to offer a hemming service for my fabric workshops. Many Singaporeans, and especially travelling expats, don't have a sewing machine. Having both pre-hemmed and no-hemmed fabrics available means that people can choose according to their purpose. Some students use their fabrics in patchwork or to sew into larger items. Others simple want to use it as a decorative cloth straight away. The colourfast inks we use are all hand-mixed and tested! I now have a range of colours that look great in various combinations. The inks are also completely hand washable - a little press with a hot dry iron and hey - a bit of heritage in your home! Can't wait to see how these two cushion covers turn out! To teach is to learn, and I'm grateful to my students for helping me to improve my classes each time I hold them. One other aspect that I've learnt is how important it is to take time out for oneself. It's lovely to see people describe my workshops as 'relaxing'. I watch the amazing way people get into the creative 'zone' - they loose track of time, stop checking their phones and become absorbed in their work to the point that sometimes the workshop are really quiet. I love to play relaxing music so people really get to immerse themselves in some valuable 'me-time'! As a former corporate myself in Japan, I know how stressful work can be and I'm proud that people take the time out to work on the right side of the brain. So if you think you'd like to spend some time on yourself, check out my workshop schedule and join me for a session of creative relaxation! See Student Gallery & Testimonials! If you think what I do is interesting, I'd love your support.